R401.4.2 Compressible or shifting soil. Concrete shall have a minimum specified compressive strength of f′c, as shown in Table R402.2. Concrete subject to moderate or severe weathering as indicated in Table R301.2(1) shall be air entrained as specified in Table R402.2. 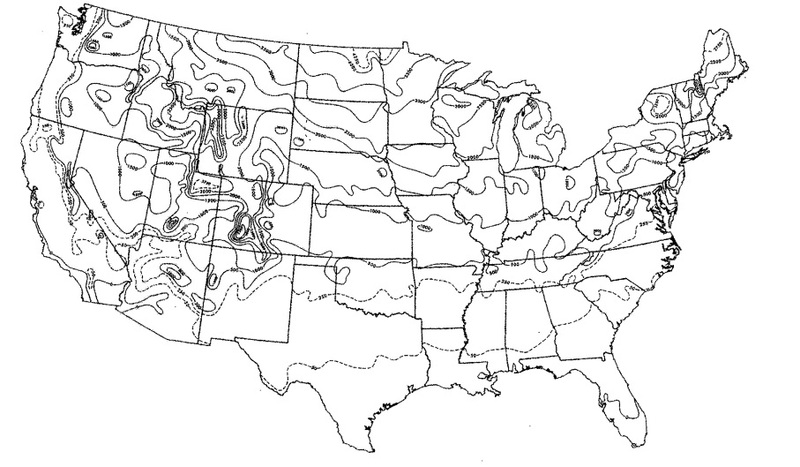 The maximum weight of fly ash, other pozzolans, silica fume, slag or blended cements that is included in concrete mixtures for garage floor slabs and for exterior porches, carport slabs and steps that will be exposed to deicing chemicals shall not exceed the percentages of the total weight of cementitious materials specified in Section 4.4.2 of ACI 318. Materials used to produce concrete and testing thereof shall comply with the applicable standards listed in Chapter 3 of ACI 318 or ACI 332. R402.3.1 Precast concrete foundation materials. 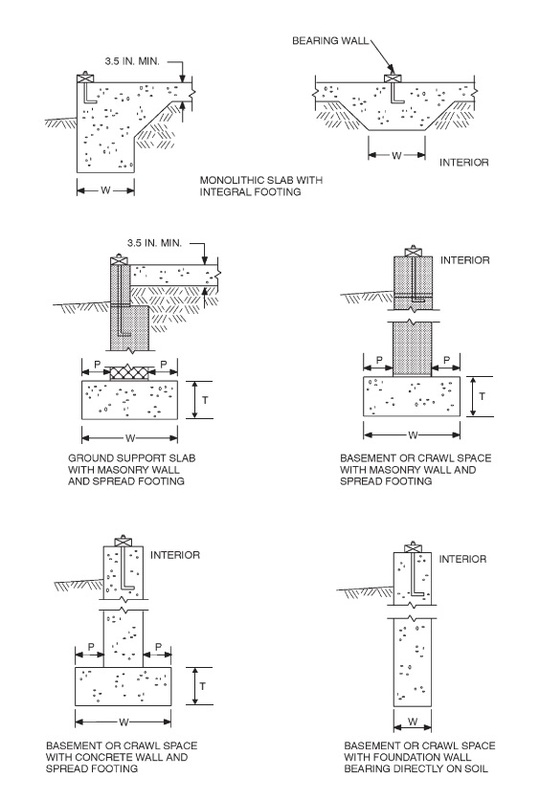 R403.1.2 Continuous footing in Seismic Design Categories D0, D1 and D2. R403.1.6.1 Foundation anchorage in Seismic Design Categories C, D0, D1 and D2. R403.1.7 Footings on or adjacent to slopes. R403.1.7.1 Building clearances from ascending slopes. R403.1.7.2 Footing setback from descending slope surfaces. R403.1.7.4 Alternate setback and clearances. R403.1.8 Foundations on expansive soils. R403.2 Footings for wood foundations. 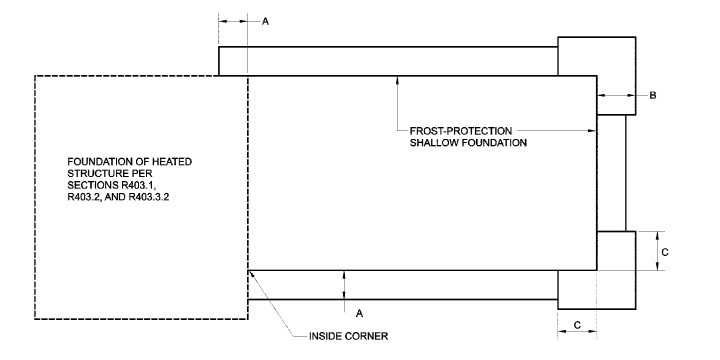 R403.3.1 Foundations adjoining frost-protected shallow foundations. 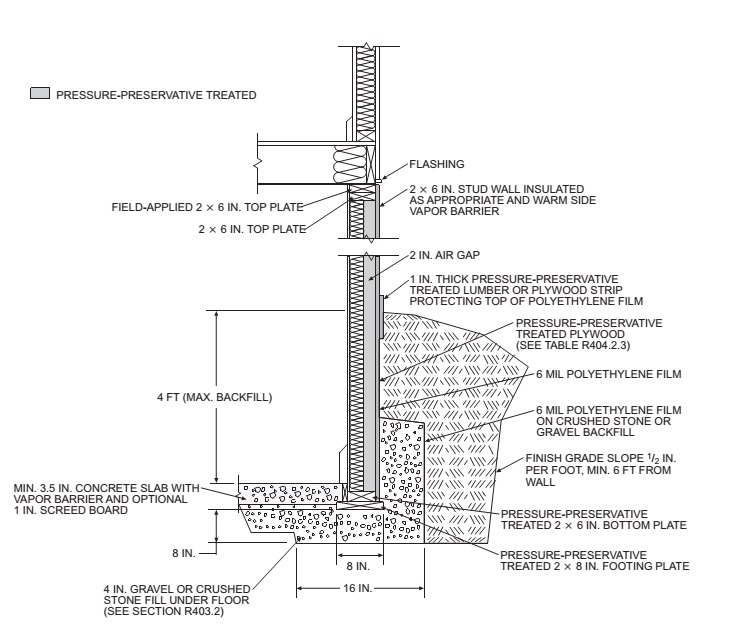 R403.3.1.1 Attachment to unheated slab-on-ground structure. R403.3.1.2 Attachment to heated structure. 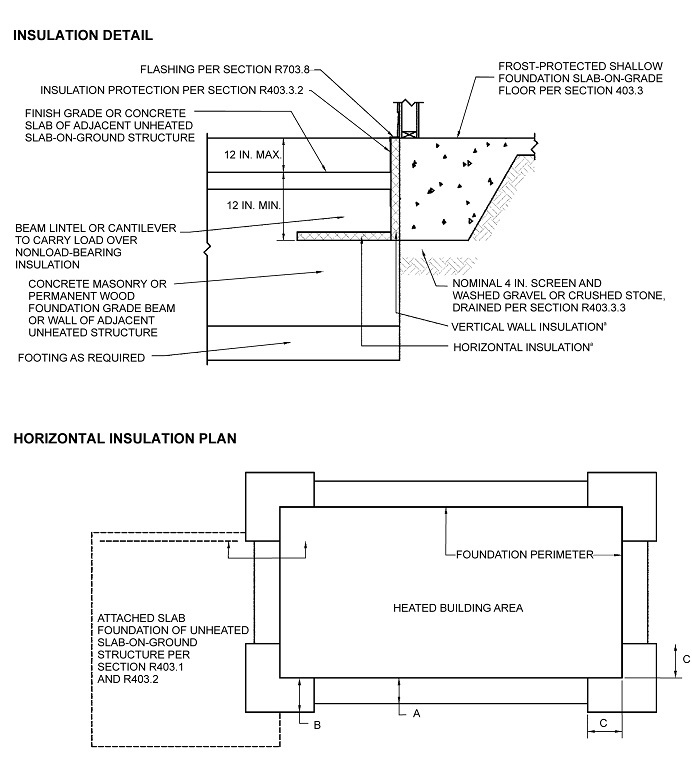 R403.3.2 Protection of horizontal insulation below ground. R403.4 Footings for precast concrete foundations. R404.1 Concrete and masonry foundation walls. 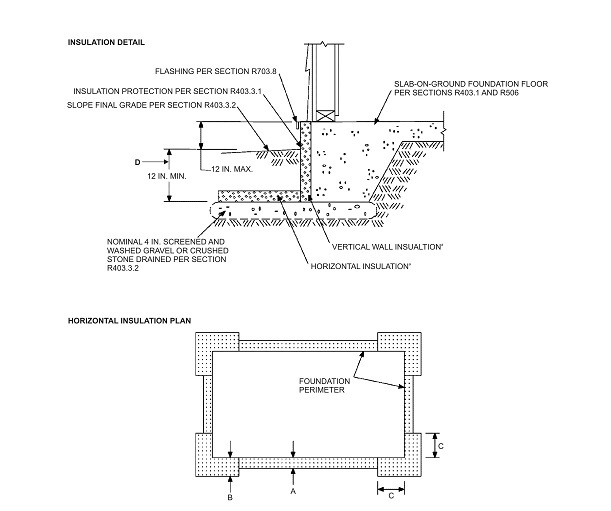 R404.1.1 Design of masonry foundation walls. 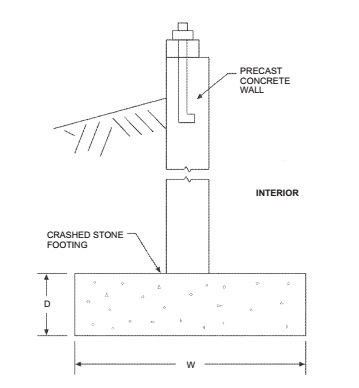 k. Concrete shall have a specified compressive strength, f ′c, of not less than 2,500 psi at 28 days, unless a higher strength is required by footnote l or m.
l. The minimum thickness is permitted to be reduced 2 inches, provided the minimum specified compressive strength of concrete, f ′c, is 4,000 psi. m. A plain concrete wall with a minimum nominal thickness of 12 inches is permitted, provided minimum specified compressive strength of concrete,f ′c, is 3,500 psi. R404.1.2.2 Reinforcement for foundation walls. R404.1.2.2.1 Concrete foundation stem walls supporting above-grade concrete walls. R404.1.2.2.2 Concrete foundation stem walls supporting light-frame above-grade walls. R404.1.2.3 Concrete, materials for concrete, and forms. The minimum specified compressive strength of concrete, f′c, shall comply with Section R402.2 and shall be not less than 2,500 psi (17.2 MPa) at 28 days in buildings assigned to Seismic Design Category A, B or C and 3000 psi (20.5 MPa) in buildings assigned to Seismic Design Category D0, D1 or D2. R404.1.2.3.2 Concrete mixing and delivery. R404.1.2.3.4 Proportioning and slump of concrete. R404.1.2.3.6 Form materials and form ties. R404.1.2.3.7.2 Location of reinforcement in wall. R404.1.2.3.7.6 Alternate grade of reinforcement and spacing. R404.1.2.4 Requirements for Seismic Design Category C.
R404.1.4 Seismic Design Category D0, D1 or D2. R404.1.5 Foundation wall thickness based on walls supported. R404.1.5.3 Pier and curtain wall foundations. R404.1.6 Height above finished grade. R404.1.9.2 Masonry piers supporting floor girders. R404.1.9.3 Masonry piers supporting braced wall panels. 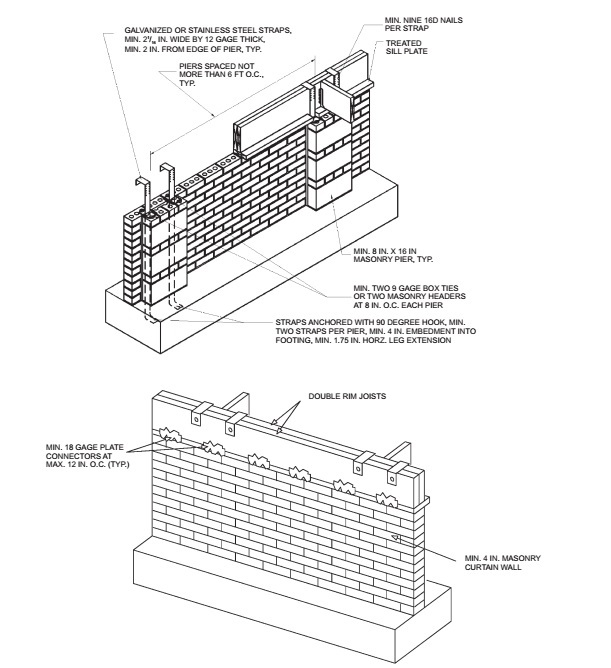 R404.1.9.4 Seismic design of masonry piers. R404.1.9.5 Masonry piers in flood hazard areas. The studs used in foundation walls shall be 2-inch by 6-inch (51 mm by 152 mm) members. When spaced 16 inches (406 mm) on center, a wood species with an Fb value of not less than 1,250 pounds per square inch (8619 kPa) as listed in AF&PA/NDS shall be used. When spaced 12 inches (305 mm) on center, an Fb of not less than 875 psi (6033 kPa) shall be required. 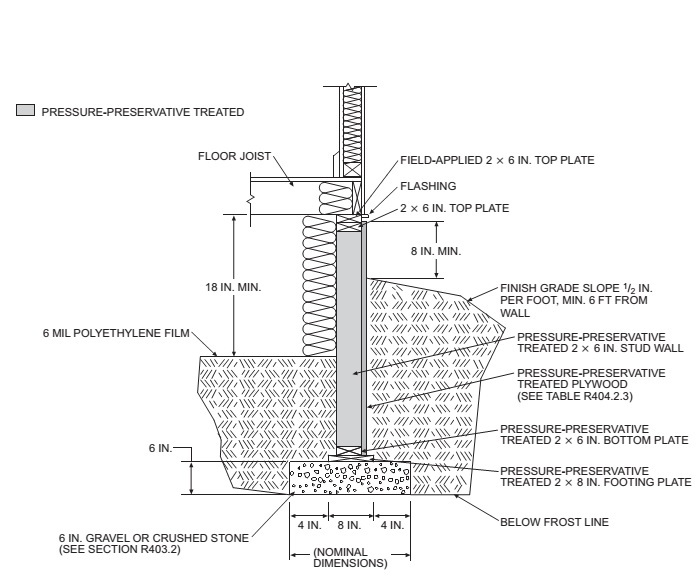 For wood foundations that are not designed and installed in accordance with AF&PA PWF, the height of backfill against a foundation wall shall not exceed 4 feet (1219 mm). When the height of fill is more than 12 inches (305 mm) above the interior grade of a crawl space or floor of a basement, the thickness of the plywood sheathing shall meet the requirements of Table R404.2.3. R404.5 Precast concrete foundation walls. 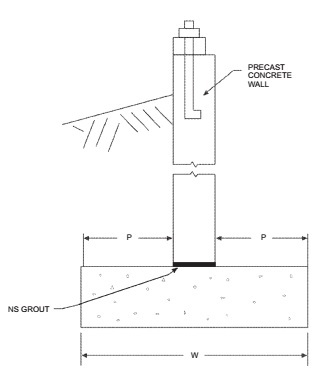 R404.5.2 Precast concrete foundation design drawings. R405.1 Concrete or masonry foundations. R406.2 Concrete and masonry foundation waterproofing. R406.3 Dampproofing for wood foundations. R406.4 Precast concrete foundation system dampproofing. R408.2 Openings for under-floor ventilation.